What is your relationship to/with power? This talk will be a combination of lecture, dialogue and experiential exercise some of which will do in this class and some you can do at home – that are best to do on the day of the day of New Moon. Children are as unique as our bond with them. And although we love our children equally, our relationship with each of them is different. These differences are seen clearly when one looks at a child’s astrology. This lecture explores how and why astrology is an invaluable tool for understanding your child. There are constants when it comes to parenting, but because every child is unique there is a need to tailor the parenting of that child accordingly. To illustrate this uniqueness, I will discuss some fundamentals of astrology as a parenting tool, with both general and specific examples gathered from my client work. Over the years I have come to see firsthand what C.G. Jung once wrote in a letter to B.V. Raman: “In cases of difficult psychological diagnosis, I usually get a horoscope [astrology chart] in order to have a further point of view from an entirely different angle. I must say that I very often found that astrological data elucidated certain points, which I otherwise would have been unable to understand”. Please join me to gain insight into how this ancient and powerful tool can help you understand and support you and your child. Dr. Tadd is available for speaking and teaching engagements; please contact her for details or to set up a speaking engagement. What’s Your Moon Sign? Discovering Emotional Wellness Through Astrology. Today many of us are familiar with reading our horoscope – be it in the newspaper, the back of Vogue or one of the numerous blogs. But, astrology is so much more than just the time of the year you were born. In astrology, the time, date and place of your birth are used to calculate the location of each planet and luminary, and each represents different parts of life. The Moon is representative of our emotions; how it feels to be alive. In discovering your Moon sign you will gain insight into your emotional nature; how you express your emotions, what contributes to your being out of balance, and how to regain emotional wellness when things in life go sideways. Venus Retrograde: What do you really want? While Mercury being retrograde has become a bit of a colloquial phrase, it is not the only planet that goes retrograde. Approximately every 18-months Venus goes retrograde. This year on October 5th she will turn on her heels, and not be direct again until the 16th of November. When Venus is retrograde, we are asked to re-evaluate. In this talk, we will explore how to make most of this time. What should we do to prepare for this shift? What would be best to avoid once she is retrograde? And equally important, how can we use this time in the most productive positive way possible. This period can make it difficult to get, or even know, what we want. But, it is simultaneously asking us to look at what and who we value, what and who we want. It is a time to check-in and sees if those wants, those needs, still hold true. Or is there something that needs re-evaluation. Today many people know their “sign”; you are a Leo because your birthday is August 12th, or a Capricorn because it is December 30th. But the truth is astrology is much more complex. This Sun Sign astrology (as astrologers refer to it) with its corresponding newspaper column and blog post only goes back to 1930, with the birth of Princess Margret. In truth, the roots of astrology go back to Babylon and have been used by leaders, scholars, authors, artist, business persons and layman for millennia. In this talk, I will discuss some of the many ways astrology is used today; how it is an invaluable tool for understanding ourselves, our relationships and the perfection of the timing of events. Today many of us are familiar with reading our horoscope – be it in the newspaper, the back of Vogue or one of numerous blogs. But, astrology is so much more than just the time of the year you were born. In astrology the time, date and place of your birth is used to calculate the location of each planet and luminary, and each represents different parts of life. The Moon is representative of our emotions; how it feels to be alive. In discovering your Moon sign you will gain insight into your emotional nature; how you express your emotions, what contributes to your being out of balance, and how to regain emotional wellness when things in life go sideways. ***Although not required, for those who preregister I will calculate the location of your Moon before class. To do so I will need the time, date and location (City, State, Country) of your birth before class. (All personal data will be kept confidential). Please email me or go the contact page. Symbols are everywhere, in both our waking and dreaming lives. In this dream group, we will explore some of the ways we can find meaning out of our dreams; what are they telling you? Is there something within the dream that can give you answers to questions you’ve been grappling with? Or maybe there is something with in the dream asking you to make a change in your life in some way? Rather than just be a class on the theory of dreams, we will work with dreams themselves, so bring one to share. Depending on the size of the group, and richness of a given dream, we may not get through everyone’s dreams but the exercises will still be beneficial to all in attendance. On March 17th, there will be a New Moon in Pisces, the sign of dreams, music, spirituality, escapism and wine. New Moons are times of new opportunities, of setting intentions and beginnings. Before the Moon is obscured from view this month come explore what this New Moon has to offer us and how best to work with that opportunity. Come get dreamy in this experiential class with lecture, discussion and exercises. In our culture the Full Moon gets a lot of attention, (people always seem to get a little crazy on Full Moons) but did you know that the New Moon is of equal power an importance to pay attention to and work with? This New Moon, on the 17th, will be in Pisces the sign of dreams, music, spirituality, escapism, and wine. New Moons are times of new opportunities, of setting intentions and beginnings. 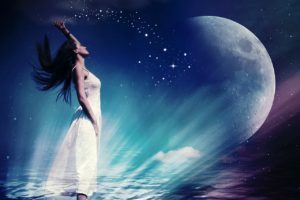 Before the Moon is obscured from view in March lets explore what this New Moon has to offer you and how best to work with the change she can bring. Come get dreamy with me in this experiential class with lecture, discussion, and exercises. Since the earliest days in human history our ancestors of looked to the sky for answers. Slowly as they observed the sky they began to find correlations with the locations of, what we now know as planets, to the events in their lives. Mythic tales, metaphoric legends of gods, goddesses and creatures were created to help translate this stellar story. In fact, the etymology of the word Astrology is the story of the stars. In this talk Laura will discuss how she came to be an astrologer, and a quick look at its evolution over millennia. Primarily she will talk about her client work and the numerous ways an astrological view of life can be empowering, transformative and healing. You are not as the 1970’s pick-up line implies, just your sign. Today astrology is used not just as a divination tool, but as a form of self-help, understanding and improving relationships, as a cosmic clock to aid in the timing of actions, in business and retrospectively to help understand past events. “We are born at a given moment in a given place and like vintage years of wine we have the qualities of the year and of the season in which we are born. Astrology does not claim anything else”. New Moons are times of beginnings. It is a time to set intention and call to us the things that we want. In this talk we will look at this month’s New Moon and how to work with its powerful energy. With this month’s New Moon in Scorpio it’s all about transformation and desires. What do you want? And what do you want to change? Because the talk will be on the day of the New Moon we will also do some experiential exercises to make use of this powerful day. Come play with the Moon. You’re Not Just Your Sign: An introductory exploration into the history and many uses of astrology. Today many people know their “sign”; you are a Leo because your birthday is August 12th, or a Capricorn because it is December 30th. But the truth is astrology is much more complex. This Sun Sign astrology (as astrologers refer to it) with its corresponding newspaper column and blog post only goes back to 1930, with the birth of Princess Margret. In truth, the roots of astrology go back to Babylon and have been used by leaders, scholars, authors, artist, business persons and layman for millennia. In this talk, I will discuss part of this cosmologies history as well as some of the many ways astrology is used today; how it is an invaluable tool for understanding ourselves, our relationships and the perfection of the timing of events. What? Mercury is Retrograde Again? On August 12th Mercury will be going retrograde. This retrograde starts when he is in Virgo, a sign linked with service, analysis and perfection. Mercury will be retrograde until Sep. 5th having gone back into Leo, the sign of play, passion and ego. In this class you will learn how to make the most out of Mercury Rx, both what works well and what to be careful with. A retrograde is not something to be feared, it is an opportunity to reboot and get a do over. What do you need to do again and how can you make the most of your take two? Astrologically speaking a New Moon happens when the Sun and Moon are in the same sign. Every few years we have two New Moons in the same sign back-to-back. This can only happen if the first New Moon happens on the first day the Sun is in that sign, so there is enough time for the Moon to move through its 28-day lunar cycle and sill be in the same sign at the start of a new phase. This year is one of those years. This time it is playing out in Leo. We have not had two Leo New Moons back-to-back since July and August 1998 and we will not have another two New Moons in Leo until July and August of 2036. This year the second of these two Leo New Moons is a Solar Eclipse. This happening simultaneously is not unheard of, but it is unusual. An eclipse did coincide with two Leo New Moons in 1998 and 1979, but there was not an eclipse with the previous 5 two Leo New Moons in 1960, 1941, 1922 1911 or 1903. In this class, there will be some exploration into the Solar eclipse that takes place on Aug. 21st, but the emphasis this month will be in preparation; working with the New Moon leading up to the eclipse. In the class, I will discuss how you can work with this first Leo New Moon, as you prepare for the Solar eclipse is August. This will be an experiential class so you come away with more than just information in the lead up to these New Moons. And with the new Moon in Leo the sign of the child, come ready to learn and play. Children are as unique as our bond with them. And although we love our children equally, our relationship with each of them is different. These differences are seen clearly when one looks at a child’s astrology. This lecture explores how and why astrology is an invaluable tool for understanding your child. There are constants when it comes to parenting. But because every child is unique there is a need to tailor the parenting of that child accordingly. To illustrate this I will discuss some fundamentals of astrology as a parenting tool, with both general and specific examples. Additionally, I will discuss how an astrological view illuminates what you are learning from your child; they are as much your teacher as you are theirs. With ever growing frequency the term Mercury Retrograde is being used. Often when something goes wrong or brakes it seems the question is posed: “Is Mercury Retrograde?’ And while he is retroceding multiple times a year this planetary phenomenon gets a bad rap. Yes, it can be a time of combination and technological brake down. But there are things the energy of this time is asking of us as well, and ways we can make the most of these tree week periods of time. In this talk, we well discuss not only how to navigate the pitfalls and traps this trickster can lay, but also how to work with this energy, and have it work for you in the most advantage way possible. While Mercury being retrograde has become a bit of a colloquial phrase, it is not the only planet that goes retrograde. Approximately every 18-months Venus goes retrograde. This year on March 4, 2017, she will turn on her heels, and not be direct again until the 15th of April. When Venus is retrograde, we are asked to reevaluate. In this talk, we will explore how to make most of this time. What should we prepare for in the preceding weeks? What should we avoid once she is retreating through the zodiac? What should we approach with caution or try to avoid? And equally important, how can we use this time in the most productive positive way possible? This period can make it difficult to get, or even know, what we want. But, it is simultaneously asking us to look at what we value, what and who we want in our life. It is a time to check-in and sees if those wants, those needs, still hold true. March 4th Venus the planet of love, values, beauty and relationships will appear to be moving backward (retrograde) in the sky. Before she turns on her heels there are a few things we can do in preparation. If you are planning a fashion or beauty purchase, such as a new hair color, do it now, before the retrograde. Venus Retrograde asks us to reevaluate what and who we like, love and value. March 4 – April 15 is the perfect time for Spring Cleaning, to clear out what you no longer like and let go. In astrology, we often talk about how a square blocks or impedes a planet from fully expressing itself, and that this obstacle leads to challenge and frustration for the native. But are obstacles always a bad thing? I explored this question in my article Re-framing Squares in the 2015 June/July issue of The Mountain Astrologer. In the article, I spoke to of how astrologers often fail to explore the fact that within the blockade of energy indicative’ to a square is a huge gift. For a squares impact is not limited to the positive, healthy, beneficial archetypal qualities of a planetary signature– the shadowy, negative, and toxic aspects are also blocked and impeded from manifesting with ease. The energy a square brings in does not cannot, cherry-pick what it obstructs; blocking only the positive and letting the negative run wild and free. It must impact all qualities of the signature. In this class, we will explore this idea further. We will look to chart examples to understand the complexity of this aspect and how labeling it one of the “hard” aspects can lead to a failure to see the gifts it provides. We will look at the more common interpretation of a given square as well how the blocked energy a square creates can be in one’s best interest. October 14, 2015: Astrology as a Tool for Parenting at East West Books SeattleChildren are unique, as is our bond with them. And although we love our children equally, our relationship with them is different. These differences are seen clearly when one looks at a child’s astrology. For this talk I held a discusses astrology is an invaluable tool for understanding your child. There are constants when it comes to parenting, but because every child is unique there is a need to tailor the parenting of that child accordingly. To illustrate this Laura will discuss some fundamentals of astrology and parenting, and provide examples of how a child is impacted by their astrology. Additionally, she will discuss how an astrological view illuminates what you are learning from your child. They are as much your teacher as you are theirs. In this community webinar, I will look at Uranus throughout the zodiac and historical events reflective of that alignment. Particularly with Uranus, as part of its meaning is tied to society and community, exploring how the archetype is expressed at the collective level deepens our understanding of the archetype and thereby how it may be expressed at an individual level. A discussion panel on astrological research. In this talk, I discussed the planet Mars in the sign of Libra. In astrology Mars represents our drive & ability to go forward. As the God of War, he also represents anger and aggression. The sign of Libra is associated with partnerships, balance, and fairness. What happens when these two energies are forced to work together? How is self-directed Mars expressed when seen through the lens of other-centric Libra? January 28th, 2014: Action, Reaction, Re-action: Mars in astrology and how to be proactive when you feel like you are going backward. Saybrook UniversityIn this talk I will discuss the planet Mars from an astrological perspective and how it is a reflection of where and how we are driven to action and proactive ways of being. You may have heard of “Mercury retrograde”, but did you know that all planets have a retrograde cycle? Mars is going Retrograde on the 1st of March. Where as when Mercury is retrograde it can bring a breakdown in communication and technology, Mars retrograde can make it difficult to move forward. Unlike the Mercury retrograde that is about 3 weeks, Mars will be retrograde for 2 1/2 months. In this talk, I will also provide some suggestions as to how to make the most of this time that can feel like you are going the wrong way on the escalator. We will explore how you can remain driven in school, in work all parts of your life- and what are the advantages of having to slow down and or do things over? This talk addressed some of the underlying principles of an astrological philosophy, and how understanding the relationship between the cosmos and life here on earth is an invaluable tool. Over the course of the hour, we explored what is meant by astrology and why it is relevant in the context of an organization. For example: in recent decades the term Mercury retrograde has become a more commonly known phrase; but what is it exactly? Is it really this doomsday-like event, occurring multiple times a year, or are there benefits to this astrological occurrence as well? In Western astrology, the planet Uranus is representative of innovation, revolution, rebellion and humanity. He is the rebel with a cause. Unlike the Moon that moves through a sign in just over two and a half days, Uranus takes just over 84 years to orbit the zodiac, staying in one sign for around seven years. Currently, Uranus is in the sign of Aries where he has not been since 1935. In this talk, I discussed how the innovating rebel is expressed throughout each of the 12 signs. Uranus is believed to be the higher octave of Mercury. That is Mercury or the Mercury archetype expresses how one gathers and analyzes knowledge- with Uranus we see how one comes to new and unconventional ideas. Uranus represents your aha moments – seeing & understanding things in a completely new way; be it you, your larger community, cultural or even at global scale. By understanding the sign Uranus was in at the time of your birth you can come to see where your thoughts and actions have the greatest potential to be groundbreaking and cutting-edge. In Western Astrology, each celestial object in the sky represents different archetypes and parts of the self. The planet Mercury, like its Roman namesake, is about communication. In astrology the sign you have Mercury in, that is where it was when you were born, is seen to reflect how you think and communicate. Do you tend to think and communicate in a methodical deliberate manner – or do you tend to think abstractly? Knowing where you Mercury is and how the god, the archetype, is working with you can lead to more effective communication as you can come to have a deeper understanding of your own strengths and weaknesses in communication. Despite how it is typically understood, astrology is a deeply complex cosmology. Horoscopes in the back of the newspaper are based on the day you were born and are but a fragment of astrology. In truth, all planets, all asteroids, as well as the sun and the moon, were in a sign when you were born. Each of these celestial objects represents a different part of the self. Although some may have been in the same sign as the Sun when you were born others were not; representing the complexity that is you. In this talk, I spoke about the Moon in astrology. Looking at: What archetype the Moon embodies – what it means for her to have been in a given sign when you were born and how can knowing this help you to move through life with greater grace and ease.